If you are having trouble in starting your vehicle, it may be time to replace its battery. Having a dying, corroded or broken battery is a very common reason that your vehicle won’t start or crank. It is a prominent part of a car which provides power to start and operate smoothly. But when your car battery is old or about to die it isn’t very easy to get rid of it. You can’t simply throw it away in waste because it is made up of a plenty of hazardous materials. Take for example, hybrid automobiles are powered by nickel-metal hydride (NiMH) and lead-acid batteries. If somehow their chemicals get into the ground, it will simply deteriorate the entire surrounding. It is due to the leaking of harmful acids, chemicals, non-biodegradable plastics and lead. In most countries, people are penalised if they dump a dead or worn-out auto battery in the trash. This is essentially done to protect the health of the environment from the toxic chemical present in them. For instance, lead is a very dangerous element that can severely contaminate the environment. If it spills, you will have real trouble in cleaning it up. Make sure to keep it out of your kids reach as it can seriously devastate nervous systems and brain. Therefore, disposing it of is an expedient option than throwing it away to rust. Every lead-acid auto battery is made up a lot of lead around 20 pounds. Plus it is very expensive to produce new lead which is used to manufacture a lot of items like cell phone towers, auto batteries. By responsibly disposing it you can keep your environment safe and healthy. Currently, there are a number of auto part recyclers which makes it easy to protect the environment through green recycling programs. They generally take all kinds of damaged and worn-out auto parts for the purpose of recycling and reuse, for example – battery recycling. Tip 1: How it works? It is made up of a set of lead dioxide plates and lead plates in a plastic case. These plates are generally organised in cells with both lead and lead dioxide plate. This system produces electrical energy which is conducted by a liquid called electrolyte. Many vehicles have a battery that has a strong liquid as an electrolyte known as Sulfuric acid. When a vehicle start running an electrical charge is released from the alternator to the battery. It is stored in the form of chemical energy. In addition, electrical energy is emitted by the chemical reaction between the Sulfuric acid, lead dioxide plate and the lead plate. This facilitates the cells to generate electricity of about 2 volts. Typically, a standard battery with 6 cells generates 12 volts of electricity. As a result it provides good performance for many years (usually for 4-6 years). Tip 2: What are the signs that a battery needs a replacement? A lot of factors go in when it comes to determining the lifetime of a vehicle battery. For instance, three general factors are the type and brand of your automobile, your driving style and weather situations. Typically, the average life expectancy of an auto battery lies in between 4 to 6 years. Make sure to replace it quickly when you notice that it is bulging, bloating or leaking a lot of fluid. It can be due to missing caps which stop leaking of fluid. If you are not able to find replacement covers from your local auto part store, make sure dispose of the battery instantly. However, sometimes you can still use it after charging in case when it is simply exhausted. But if it doesn’t work even after charging, you should better discard it. You can also resell it for a reasonable price after getting it inspected from your local auto part shop. Basically, they will conduct a load test in which they will put the battery under load to know how much amperage it maintains. It will also help them to check its charge level. If your battery fails to pass the load test or declared as damaged or irreparable. Make sure to discard it in an eco-friendly way. Look for a professional recycling centre at your location. Today you can easily find one using internet search or your local directory. Make sure they accept batteries of all types of vehicles. These centres run recycling programs to handle toxic and hazardous items of automobiles. Before you sell your faulty part just make sure the company is certified and endorsed to do business. When you take the component to the recycling centre, make sure to store it in automobile’s floor or trunk. If you have a hybrid automobile with NiMH battery, make sure to have a look at the label on it. You must also contact its auto manufacturer to know the correct methods of recycling. If your battery is damaged but fixable, you probably sell it to auto part shop. They will buy it as a second hand item for an affordable price. This is probably the best way to recycle it in an eco-friendly way. Alternatively, you can sell the old battery when you buy a new one. However, make sure to store it properly in thick plastic packing. This will protect it from releasing toxic chemicals and preventing contamination of the environment. It will also prevent any damage to your vehicle’s interior. When you choose to replace an old battery, you can simply sell it to the retailer. Make sure to handle it safely to prevent any sort of damage that can decrease its value. It is safe to use protective gloves. Some sellers assess the core charge in the receipt of a buyer. It means that the retailer can buy an old part for some value. In return, they refurbish and resell the part to recoup a fair money. Most retailers assess the core charges on specific components like starter motors, alternators, water pumps and more. When you buy a new battery and incur core charges, you can show its receipt at the counter. They will collect your old part and pay back your core charges. Do you need a cash for car batteries? Contact your local car disposal experts. If you have lost the receipt of your new component, it may trouble you a lot. As you won’t be able to take back your core charge from the retailer. However, you don’t need to worry because you can still take help of recyclers or scrap metal services. All you have to is just search online for highly recognised junk metal recyclers in your location. If you want to know them properly, make sure to go through their website. It will show the feedback from their customers and current rates in terms of service. This will also help you to select a company which pays the best price. After this you can determine the best company and ask them if they will take your old or faulty battery. They will pay you a fair money based on its condition. If the options discussed above doesn’t work for you, make sure to seek help from a professional mechanic. They can replace your worn-out battery with a new one. This is probably a very hassle-free way to put back your vehicle in a smooth running condition. You just need to call a certified mechanic and they will come to your place to install the new part. Not only this, they will discard the old part carefully to avoid any negative repercussions on environmental health. How to dispose of batteries Properly in Brisbane, Australia? 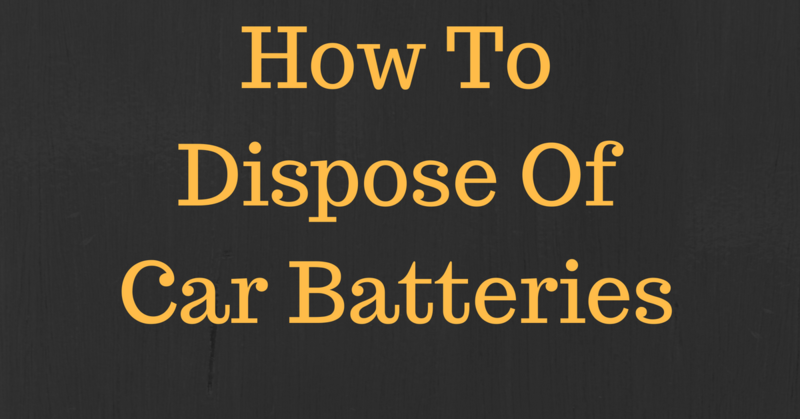 Do you need a help with disposing Battery or dispose your scrap or junk car? If you live in Brisbane or anywhere in Queensland, feel free to use one of following contact details to make an inquiry.